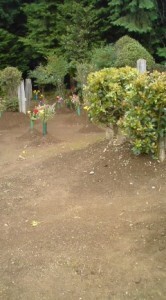 The Japanese never go very long without taking care of their ancestors or departed loved ones. In fact, there are many who pray and make offerings at their family altar (butsudan) every single day. In addition, as part of the annual cycle of events, there are four times a year (besides individual memorial days) for special ceremonies in which extra efforts are made for family members who have passed on: New Years, O-Bon (in August) and then the week around (three days before and three days after) the equinox days. In fact, there are national holidays in March and September making it possible for anyone who wishes to do so to visit their family graves for O-Higan (for a more comprehensive explaination of O-higan see my article). 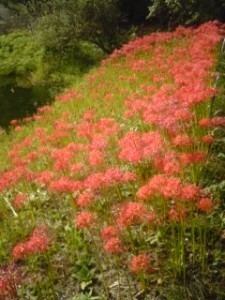 Walking around Tsukuba today, I saw many signs of this autumn`s higan-iri (彼岸入）, the first day of O-Higan. First, the graves in all the old neighborhood cemeteries have been swept and decorated with offerings of seasonal flowers. In and around these graveyards, and in many other places as well (the gardens of old houses, parks, or even along the road), are the amazing higanbana. 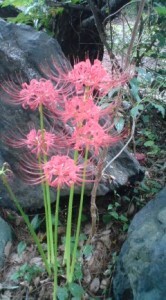 These flowers are so named for the very fact that they appear, each year, during the higan season. 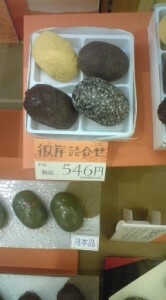 At convenience stores, department stores and traditional sweet shops, O-Hagi are on sale. These are oval shaped mochi-rice cakes, covered with a layer of sweet beans, soy bean powder, or black sesame. You can buy them individually, or in sets. The name of these traditional cakes during the autumn o-higan is o-hagi because hagi are a typical flower of this season, while the same sweet cake in spring is called botan-mochi, after the peony, a typical spring flower. You will notice that many Japanese, when talking about the weather will use the expression- atsusa samusa mo higan made (hot and cold until O-higan), which I guess means that the equinox days (spring and autumn) are seasonal and climatic turning-points. With the crazy weather we’ve been having who knows when it will get cooler. One thing is for sure, though, the nights will start getting longer and longer, until next spring’s equinox.